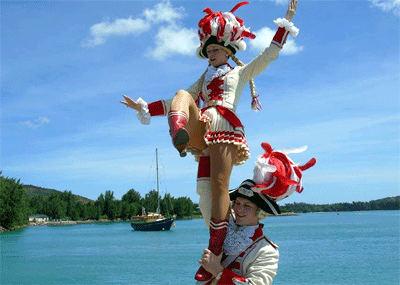 Press from all over the world converge on the Seychelles every year for the cultural event they have themselves named as the United Nations Gathering of Culture. The latest edition of this carnival in the tropics was from the 22 to the 24 of April and 23 International Delegations joined the proud Seychellois people to walk alongside delegations from seven of the top and most popular carnivals of the world. This year Notting Hill Carnival of the UK, the Brazil Carnival, the Carnival from Indonesia, the Dusseldorf Carnival from Germany, the Italy Carnival, the Cologne Carnival from Germany and the Carnival from France were all in Seychelles and paraded side by side in the parade in Victoria. The theme for this year’s carnival was unity and peace and this message was echoed by the island’s Minister Alain St.Ange in his opening remarks. The Seychelles Minister referred to the recent spate of bombs in Paris, Kenya, Tunisia and Belgium amongst others as incidents that should push the Community of Nations to not only work together, but to get to know each other in cultural events such as the Carnaval in Seychelles where everyone are treated as children of the world immaterial of the colour of your skin, immaterial of your religious beliefs and immaterial of your political affiliation. The 2016 edition of the Carnaval International de Victoria in Seychelles was jointly co-hosted by Seychelles, Reunion Island and South Africa and was seen as the island’s best edition so far. From the UK the world was informed by the reporter and cameraman of SKY News International, that the Seychelles Carnival will be broadcasted on Friday in the main news bulletin from 1800 GMT until 0600 the following morning, at around 45 past each hour. Here is the link below, the footage starts at approx. 01:25 and runs to the end. From France, the popular GALA Magazine published two photos on their Facebook page that gives a small insight of the 6e edition of the Carnaval International de Victoria in Seychelles that was held from the 22 to the 24 April. The Facebook page of GALA Magazine has 84 161 followers and is seen by 440 462 people. Joey Niclès Modeste, the photo journalists who provided GALA Magazine with the photos of Azuima Issa Miss Réunion 2015 et 4th runner-up at Miss France 2016 pageant, and Linne Freminot, Miss Seychelles 2015 at the Carnaval International de Victoria in Seychelles and also the photo of the first participation of the French “Show Band Auranja” from Normandie said he was delighted that this popular magazine published his photos. Opening these two links and scrolling down on them will show many articles about the last Seychelles Carnival:- eTurboNews at www.eturbonews.com and www.forimmediaterelease.net . From Wolfgang Thome, the popular East Africa based Blogger many articles have already been published. 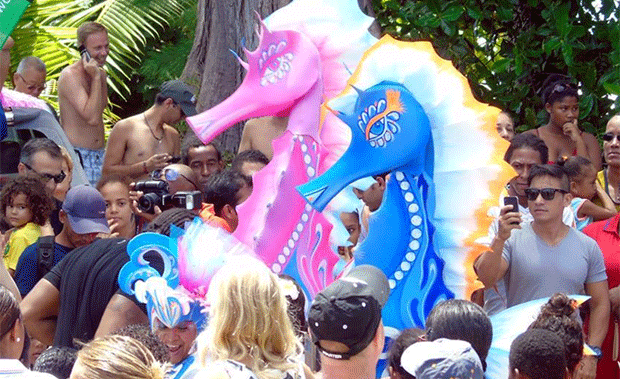 For the past five years that the Carnaval International de Victoria has been organised in Seychelles, it has always been held in the heart of the capital Victoria. But this year, for the first time, the people on Praslin and La Digue islands got a taste of this cultural manifestation. In collaboration with its partners, the Seychelles Tourism Board has been able to bring delegates from some top carnivals taking part in this year’s Carnaval International de Victoria to Cote D’Or on Praslin for a photo opportunity session with the families of the islands. Members of the Notting Hill Roadshow carnival from the UK, the Brazil carnival and the Cologne and Düsseldorf delegations gave the people of Praslin a memorable mid-Sunday morning as they performed and walked about in front of La Pirogue restaurant at Côte D’Or before posing for photos with the large crowd who had gathered to see them. Children and adults alike, Praslinois, Diguois and visitors to the island, all flocked down to the coast of the stunning Côte D’Or Beach to enjoy and mingle with members of these international delegations as a Steel Band Drummer from the Notting Hill Carnival group performed live. Present on Praslin were the Minister for Tourism and Culture Alain St.Ange, Minister for Health Mrs. Larue, who also comes from the island of Praslin, Principal Secretary for Tourism Anne Lafortune, Principal Secretary for Culture Benjamine Rose and the chief executive of the Seychelles Tourism Board Sherin Naiken. Speaking before the event kicked off, Minister St.Ange said though it has not been easy, we have made it happen for the people of Praslin and La Digue, and it is in response to an appeal made by the Praslinois to have a taste of the carnival on their island. Minister St.Ange thanked members of the delegations for taking part in this event and for dedicating their Sunday morning to travel to another island to bring added cheer to the people of Praslin. He added that the carnival is for the people of Seychelles and that it is an event that unites not only the community of nations, but also our own Seychellois nation. ‘It was an opportunity for a clean and enjoyable morning for the families gathered‘ said Minister St.Ange as he thanked the the Owners of Cat Cocos and Creole Travel for their support to make that trip by the Carnival Delegation possible. When returning to this island then two days later did this correspondent sound out Pralinois about their opinion of the event coming to the Praslin and the responses were overwhelming. Taxi drivers spoken with at the main jetty were united in their opinion that it was a splendid idea before then almost predictably adding, similar to what others spoken to yesterday also echoed, that they wanted to see more than a short display. Everyone appreciated the effort of the Tourism Minister but the prompt appeal was that next year, and for future years, perhaps a mini parade of selected participants from the main parade in Victoria could be staged on Praslin. Presently is Praslin staging one major event every year on the calendar of events for the Tourism Board, the ‘Praslin Food and Art Fiesta‘, and a mini carnival would no doubt be a huge thing for the archipelago’s second largest island. Fodder for thought no doubt in the months ahead, as the planning and execution of such a venture will require added resources but the outcome would no doubt even further cement the Seychelles’ reputation as a United Nations of Culture location, worth visiting for their festivals including the carnival or just to enjoy the pristine beaches, crystal clear water and the warm hospitality of this Creole nation.